Faure; by 2010, it became clear that the offices were unfit for purpose. The RIVP called for a design competition for a new building that was to house not just the original program but al so 30 studio apartments for young workers. The competition was won by a team composed of two young architecture firms, MAB and LAPS. Their holistic approach highlighted the relationship between city and public space by establishing a strong bond and continuity with the interior of the plot, placing the accent on its public facility character by offering an identifiable landm ark. 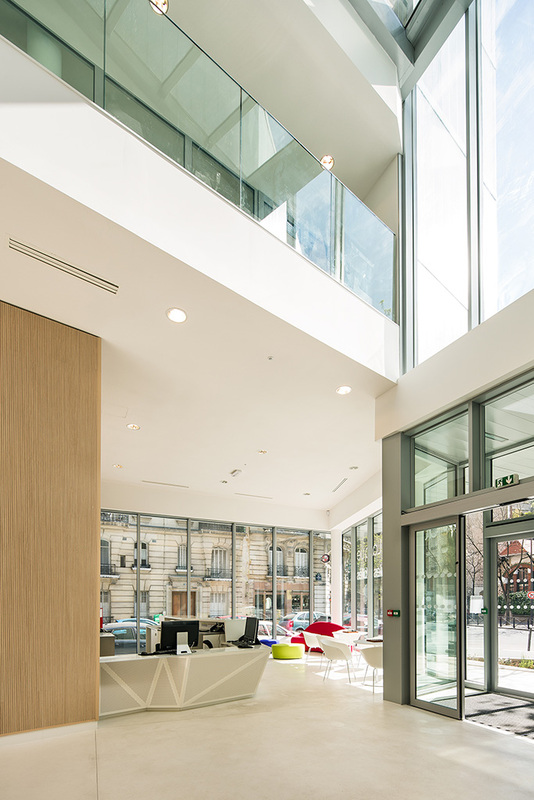 The proposition fosters user-friendliness by creating generous meeting places and favouring an opening onto the city. 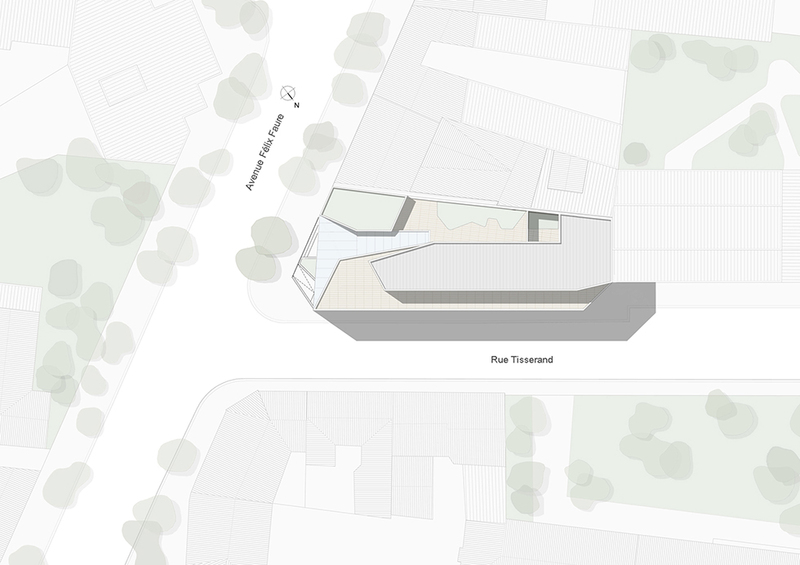 It responds to the project management’s desire to underscore the accessible and populist nature of this place in order to maintain proximity to its residents. 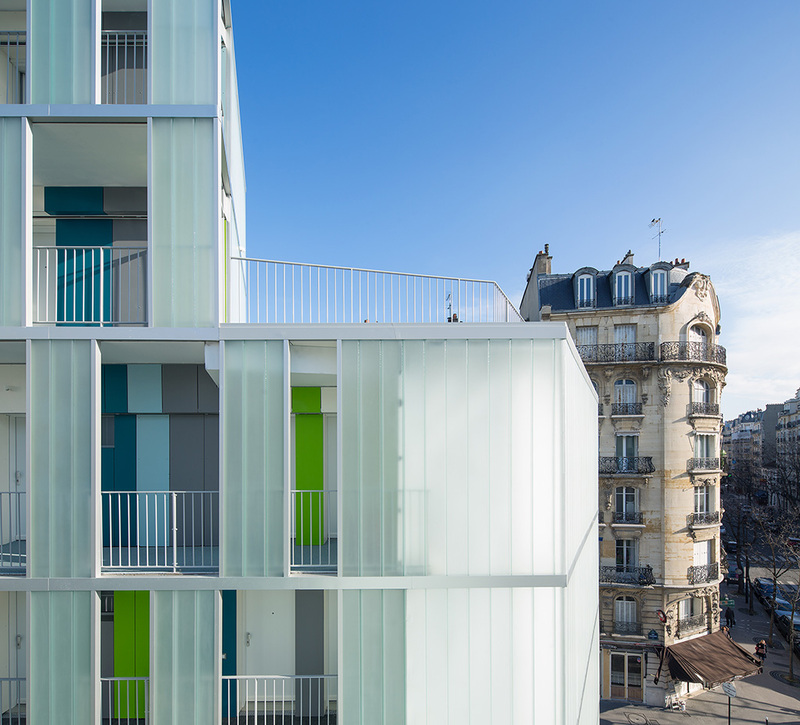 Two programs in one envelope - The building succeeds in extending several distinct levels while remaining in the same envelope, integrating two identities in a principle of uniqueness; the public program of Patronage Laïque and the private housing units. The public facility and the housing enjoy two distinct entrances. 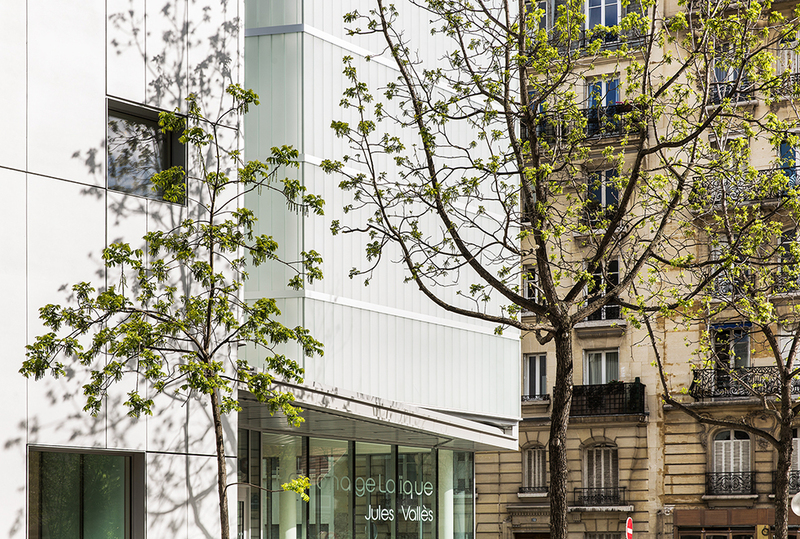 The Patronage opens wide onto Avenue Felix Faure and rises one storey from the ground floor. 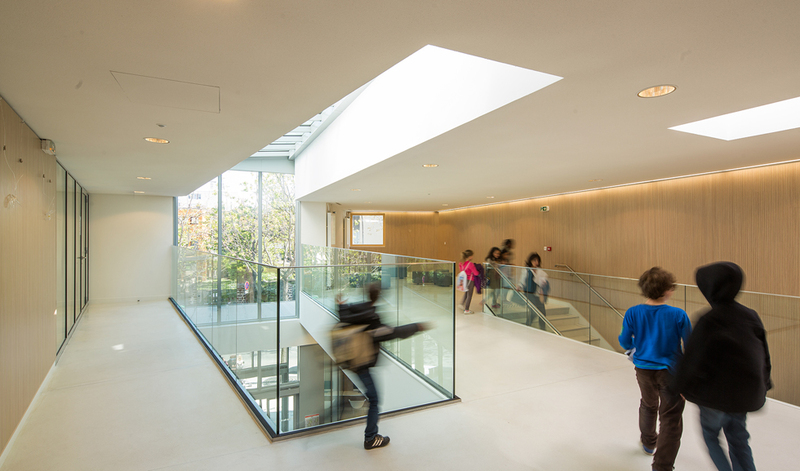 Its glassed-in atrium extends the public space within the building while enabling neighbours and the passers-by to glimpse at activities happening in the building. 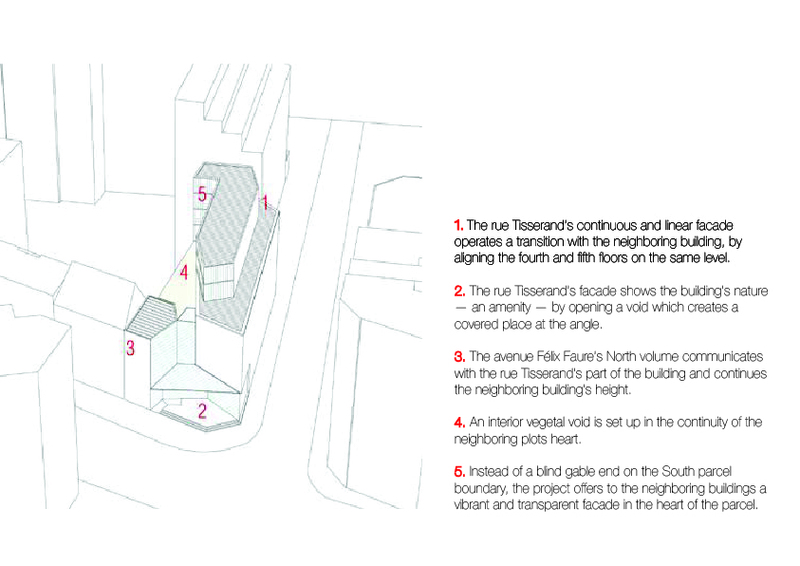 The residence has a more discrete side entrance on rue Tisserand and extends from the second storey to the fifth. 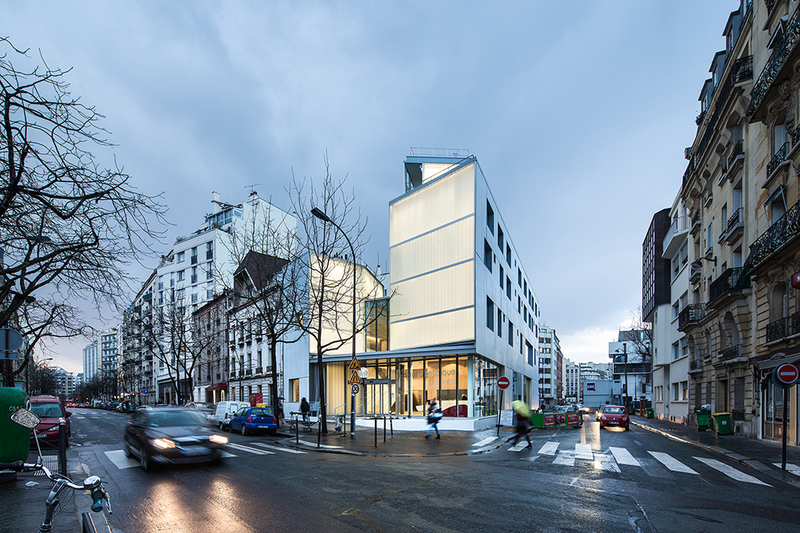 The ground-level entrance on Avenue Felix Faure anchors the facility to the ground and the neighbourhood, endowing it the same informal, homely presence of a corner cafe. 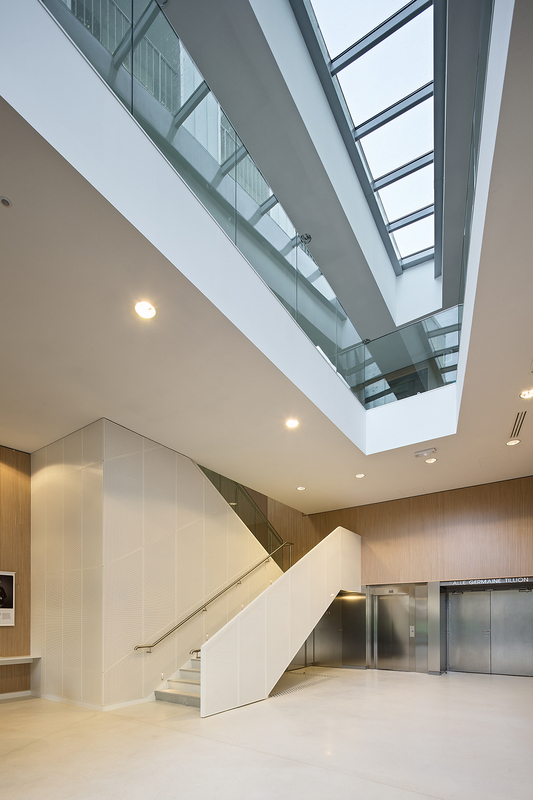 Up above, two recessed facades rise on either side of a high gap that looks down on the glass ceiling over the entrance lobby. This signpost for the project is treated in translucent white glass with opalescent reflections. 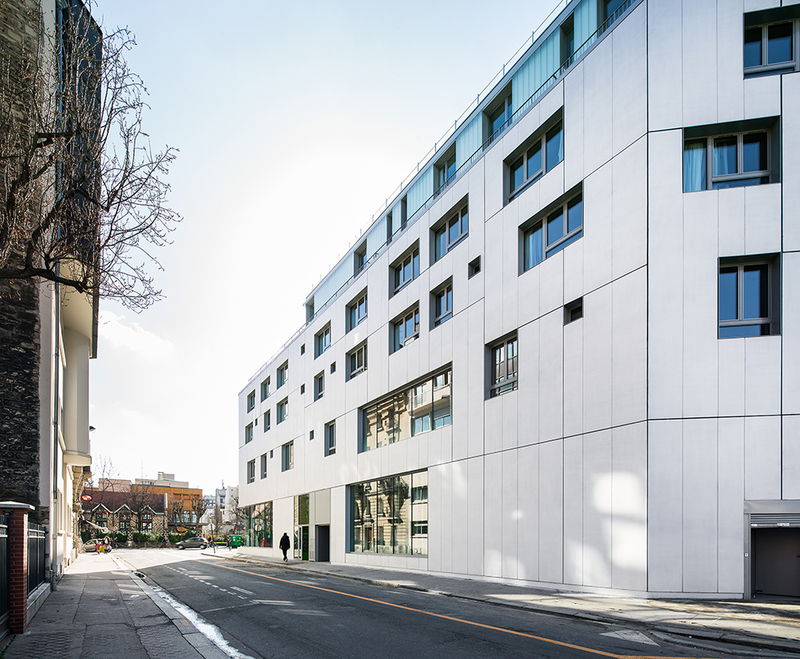 The 4-storey facade along rue Tisserand is treated in glazed concrete, the metallic reflections of which wed with the interior glazing. Its cadence is establi shed by rectangular windows of var ying dimensions and a recessed volume creating irregular modules. Light - Light is one of the project’s key components. The lobby’s surfaces take a majestic turn with light penetrating from overhead and from the sides. A choice that is even more pronounced at night when the back-lit facades of the building’s prow make the facility look like a magic lantern. A hallmark for the neighborhood and a benchmark on the avenue. 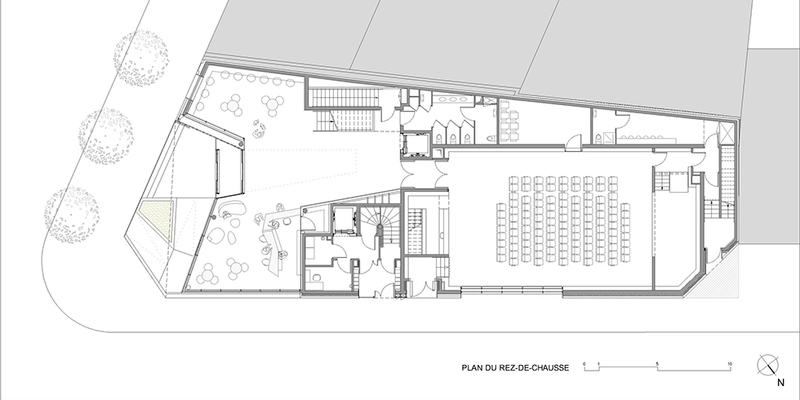 Patronage Laïque – An enclosed public place - Patronage Laïque’s reception is conceived like a covered public space. 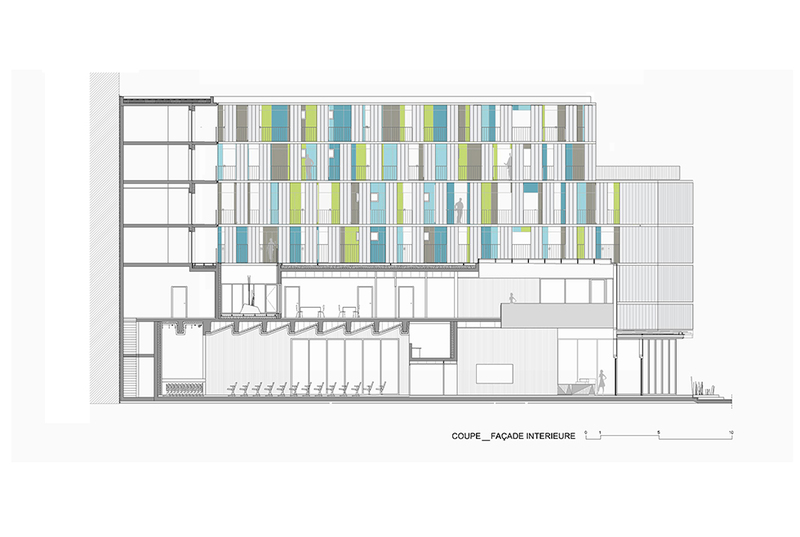 The program is housed on the ground floor, the technical mezzanine and the first floor all of which are articulated around the double-height atrium. 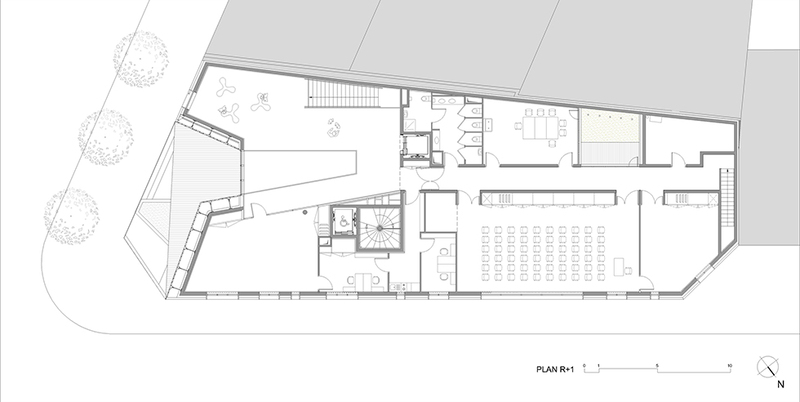 This generous open space and hallwa ys spoke off the lobby and have been designed to be occupied in a personal and informal way by users outside of the activity’s constructed framework. Giving more than what is demanded by the program in order to foster encounters between users is a way to conser ve the important social strength and identity of this place which is above all friendly and generous. 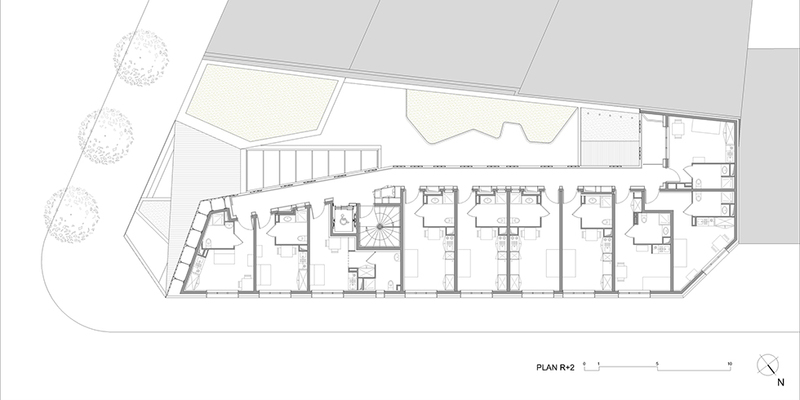 On both the ground floor and upper floor these buffer spaces are given over to the collective imagination. Beyond the computer area and cafeteria on the ground floor is the space of the multi-purpose hall, a space for entertainment wi th a stage, a control booth, dressing rooms and a small backstage. 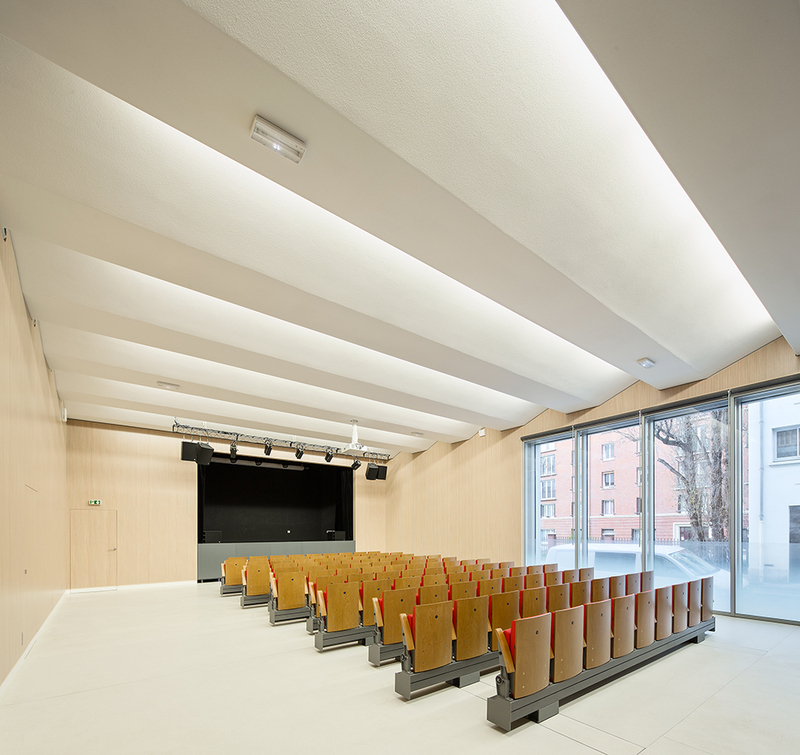 This space is designed as a genuine “box” in the project’s larger “box” and as such enjoys optimized acoustics. Its walls are lined with light, grooved acoustic wooden panels that bathe the hall in a warm atmosphere. The hall is composed of two colours: light- coloured panels for the flooring and stage, and darker tones for the balcony and control room. Stored under the stage, seats sl ide into the hall on rails, a ver y compact set-up enabling multiple uses (neighbourhood get-togethers, teas or buffets, ballroom dance floor, etc.) and an increased capacity for adding more seats if needed. On the first floor the program includes numerous activity rooms and Patronage’s offices. 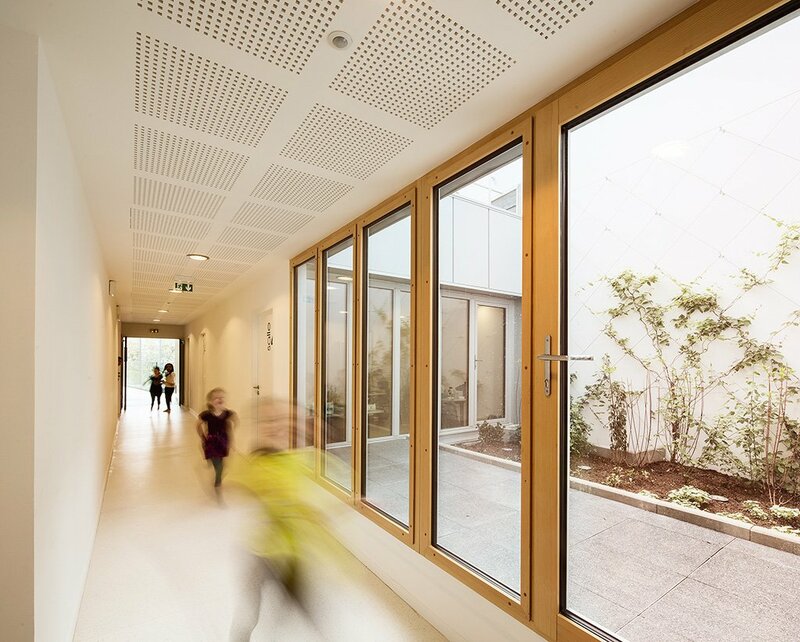 A patio provides natural light to the art room and the floor’s access hallway. Finally a large room with warm tones offers space for dance, yoga and low-impact gymnastics. The young workers’ residence hall - With its additional spaces, one of the project’s strong suit lies in its southern exposure from the plot’s inner courtyard. 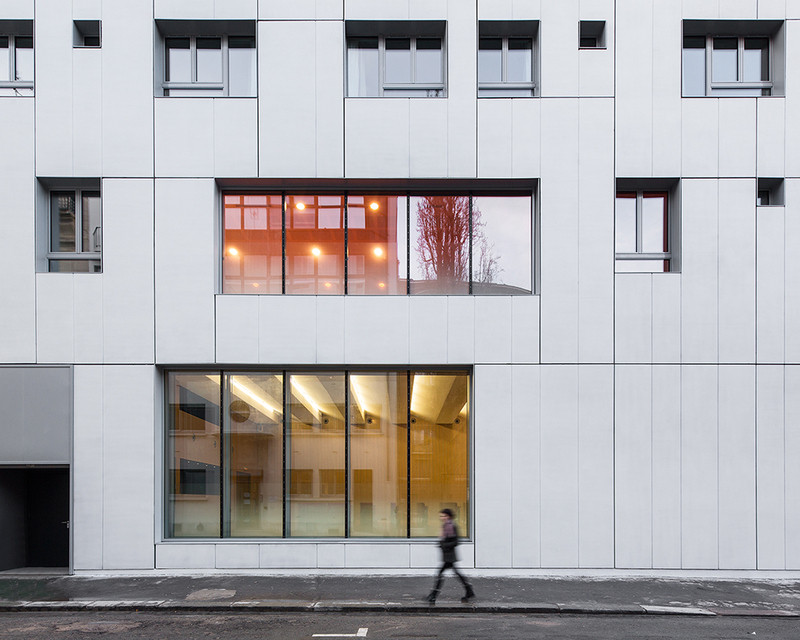 Offset from the plot’s boundar y, the building frees up a patio at the heart of the block. Instead of a blind gable end–a sad vis-à-vis for the neighbourhood–the neighbours are offered a facade of access balconies, sometimes open, sometimes opaque. The access balconies that ser ve the three dwelling levels weave their way in the open air with the architects avoiding the pitfall of a poorly lit ser vice hallway. 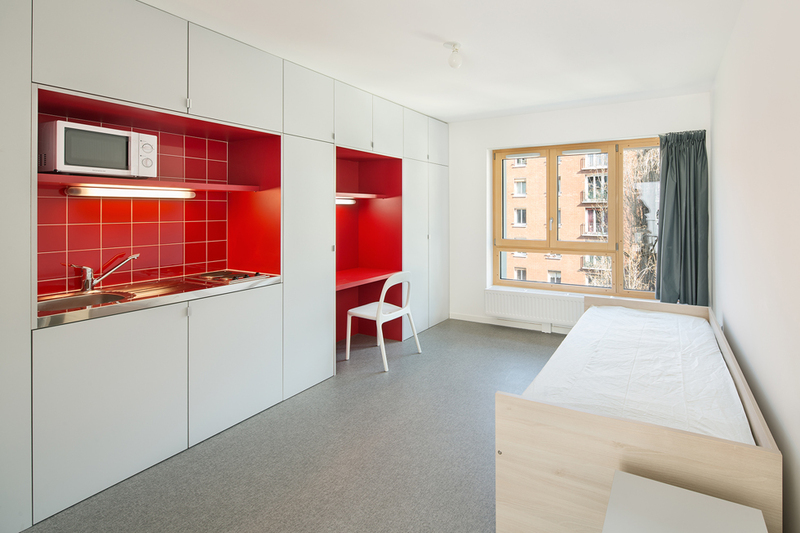 The living units combine a working wall (storage, kitchen, and office) and naturally lit and ventilated bathrooms. Generous ope rable glazing animates the studio space, the floor areas of which var y from 19 to 23 square meters. 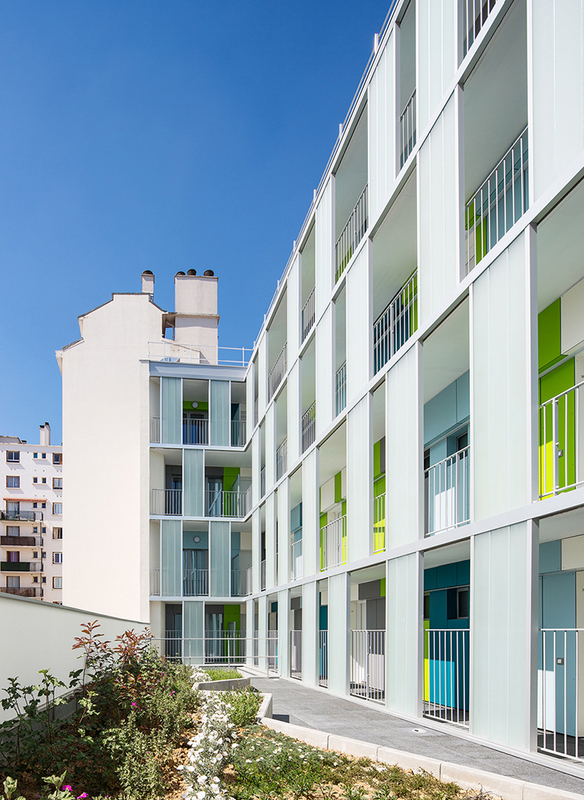 A community terrace on the building’s fourth floor overlooks Paris and dominates the preconceived ideas of joint ownership in social housing, whilst circumventing th e prospect rules makes it possible to offer each unit a private terrace. With the Eiffel Tower visible in the distance, this ambitious, radical building serenely proclaims that the stor y of night-lit state- funded buildings is not over. And that in the 21st centur y they can be lived in. 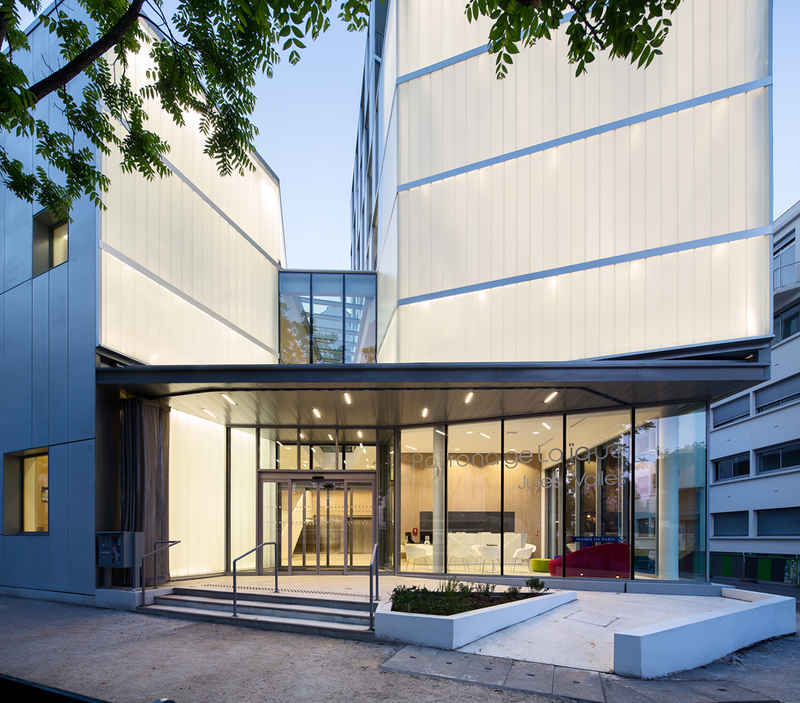 MAB Arquitectura + LAPS Architecture - The project of PATRONAGE LAIQUE in Paris was conceived by the team of MAB and LAPS, two architecture offices working together on various interna tional projects. MAB was founded in Barcelona by two Italian architects: Floriana Marotta and Massimo Basile. 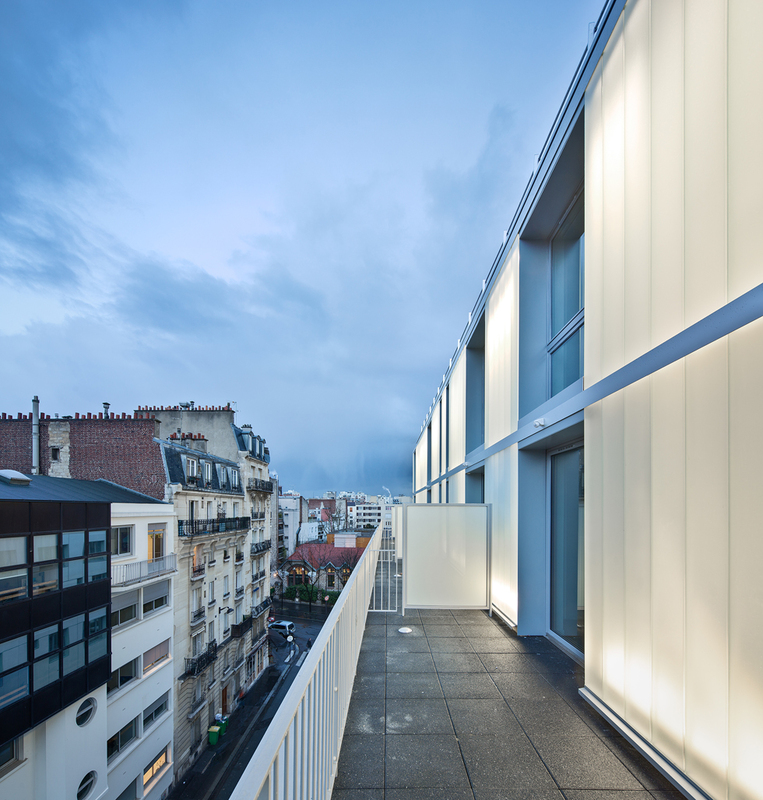 LAPS was created in Paris by architects Fabienne Louyot, Gaia Patti and Salvator-John Liotta. The partners of these two agencies shared common experiences during their education in Europe and Japan, and they continue to c ollaborate on common projects retaining the distinct identities of their agencies. This demarche allows a multidisciplinar y approach which benefits of ever yone’s experience while pursuing common objectives: a social vision for architecture, a strong relation between architectural project and urban scale, a positive and optimistic architecture, awareness of effects o n inhabitants and users, a culture of detail and great rigour during the project’s development.